She She Pop is 25 years old. We take a look at a Berlin-based performance group whose work is largely defined by two things: audience interaction and a focus on sensitive, often taboo issues. For a second, the man stares aghast. His son is on stage talking about some very personal things, alleging that his father has an aversion to “physical details” and warning: “We need to address that, Dad, if I’m going to be a carer for you at some point”. The father sits beside him and has to endure it. The son is just an actor, a member of the performance group She She Pop. But the father is his biological parent. Were they not on stage, they would probably not say these things to each other’s face. The moment of shock is brief, quickly followed by laughter and wry smiles, but the awareness of theatre’s ability to trigger unease remains. For 25 years, She She Pop has confronted audiences with sensitive issues – issues that many prefer not to discuss. 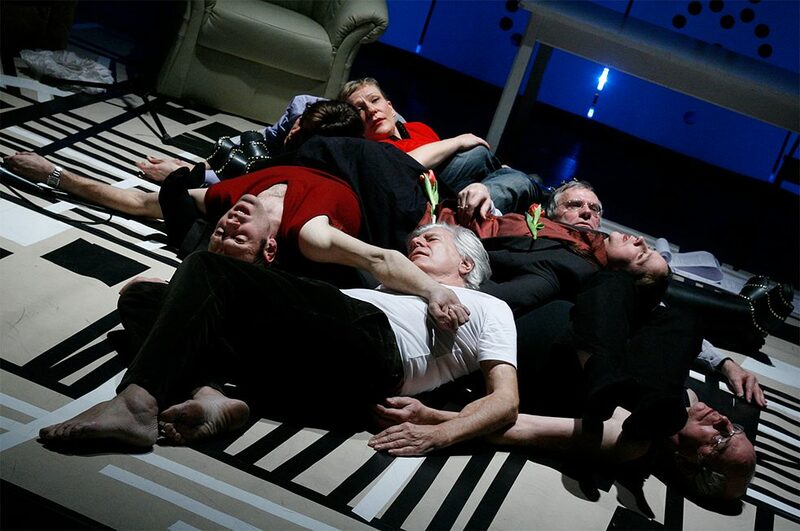 In Testament,the group look at how parents and their grown-up children “settle their obligations”, as company member Sebastian Bark once put it. Who will care for the father if he becomes bed-ridden? Is it an heir’s duty? And how will both parties cope with the unaccustomed physical contact? How do parents and children settle their “obligations”? In “Testament”, She She Pop actors talk to their fathers about car in old age. Taboo subjects are noted in writing. Here, “aversion to physical contact” is added to the list. Friends rarely talk about what they own – but She She Pop does, even on stage: “Oratorium” deals with property and ownership. The audience are often involved. Here in “Oratorium” they are provided with on-screen cues. “Drawers” brings together women from Eastern and Western Germany. From their drawers they take out public, historical texts as well as personal memories and weave them into a subjective East-West German history. She She Pop test the limits of communication in what they see as the “protective space” of the theatre. 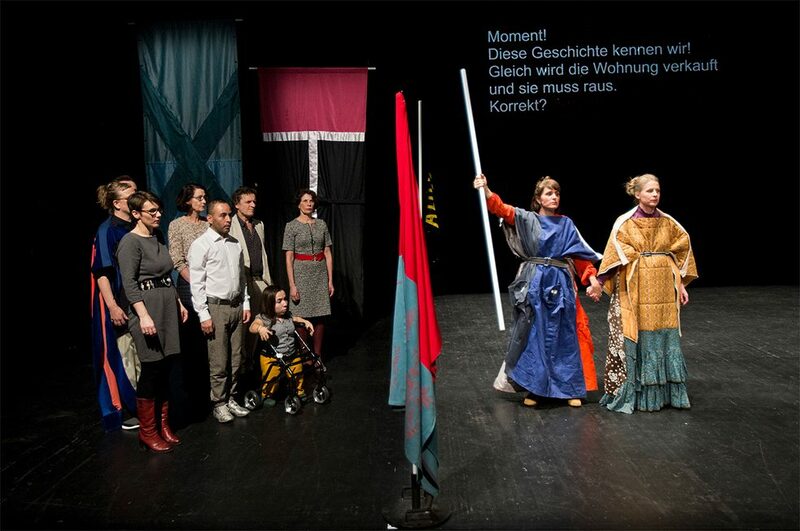 Founded in the 1990s by a group of Applied Theatre students in Giessen, where the notion of postdramatic theatre was first developed, the performance collective is today based in Berlin, where it has found its artistic home at the Hebbel am Ufer (HAU) theatre centre. Many shows premiere at the HAU before going on nationwide – sometimes even Europe-wide – tour and in autumn 2018 it was the collective’s venue of choice for a gala evening of theatre to mark its silver anniversary. 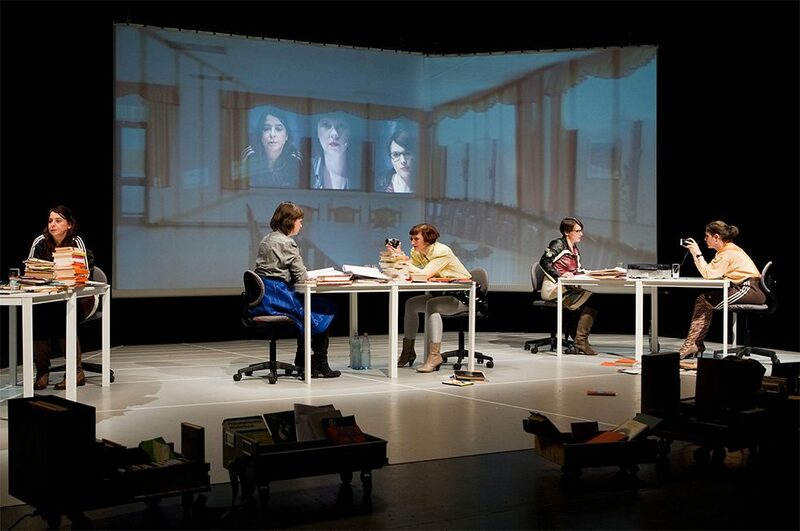 Recent years have also seen coproductions with illustrious theatres such as the Munich Kammerspiele, Schauspiel Stuttgart, Kampnagel Hamburg, Forum Freies Theater in Düsseldorf, Theatre de la Ville Paris and brut Wien. 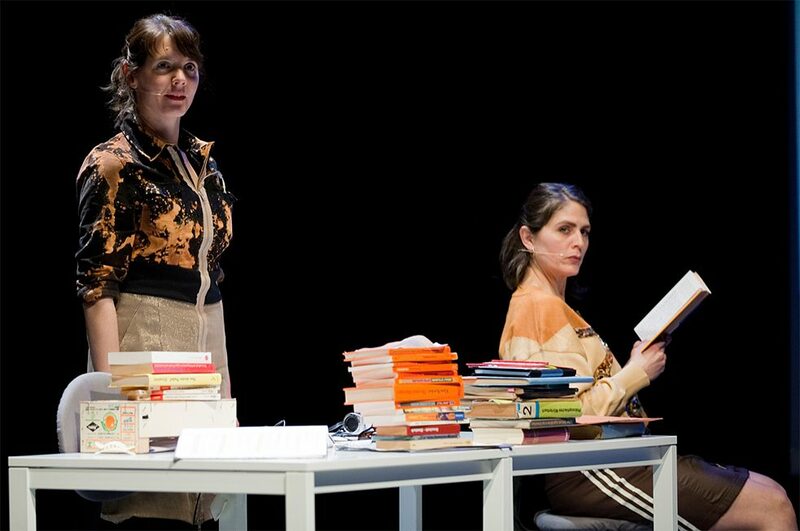 In almost 30 plays that She She Pop have written, produced and staged over the past 25 years, the artists examine their own biographies and reflect on current trends in society. In one of their earliest productions – Live! – which premiered at the turn of the millennium, they addressed the burgeoning issue of self-promotional hype. In Schubladen (Drawers), they mark 22 years of German reunification with a comparison of the experiences of women from Eastern and Western Germany. The artists refer repeatedly to canonical texts: Unendlicher Spaß (Infinite Jest) reflects on scenarios in the eponymous novel by David Foster Wallace, She She P. ist die Marquise von O. (She She P. is the Marquise of O.) deals with the issues – guilt, shame, power and impotence – raised in the novella by Heinrich von Kleist. 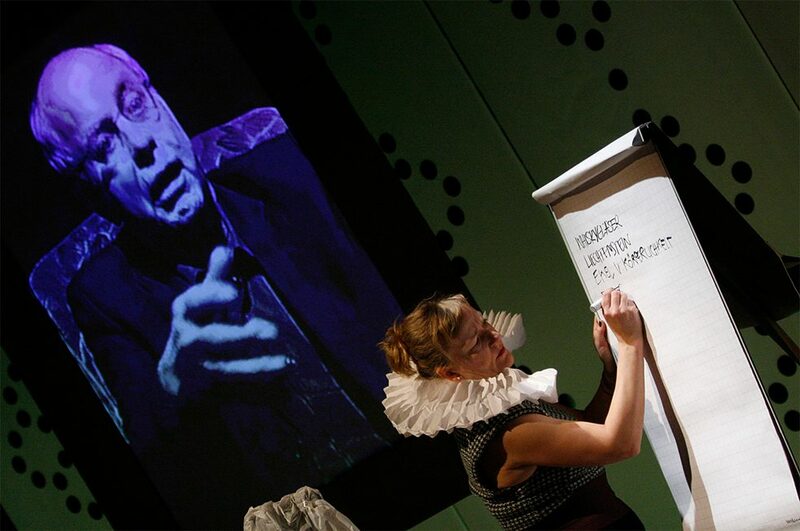 And the multi-award winning production Testament tackles a classic: Shakespeare’s King Lear with its questions about inheritance, love and agreements between generations. The collective today has seven members: Sebastian Bark, Johanna Freiburg and Fanni Halmburger as well as founding members Berit Stumpf, Lisa Lucassen, Mieke Matzke and Ilia Papatheodorou. There are no hierarchies. The artists can thus focus on what makes their work so special: experiment and interaction with guests and audience. She She Pop create a bond of community with their audience, who are sometimes just passive witnesses but more often co-actors. Members of the group play game shows or soap operas with the audience, they get people from the audience to put on costumes or encourage them to assault the actors. According to She She Pop co-founder Lisa Lucassen, the basic idea is that the artists “use themselves, their own acute experience as an example and engage with the audience in an experimental test case of public confrontation”. It is a kind of dual strategy that has now become the group’s trademark. The primary emphasis is on experiment. In a lecture for the Saarbrücker Poetikdozentur für Dramatik – a lectureship awarded to She She Pop in summer 2018 – Lucassen explained: “An experimental setup is created in which all those present make decisions that are both serious and lighthearted, in which attitudes can be adopted and, as it were, tried on for size.” In some plays – she added – the audience are guided “politely but firmly to the boundary of shame”. 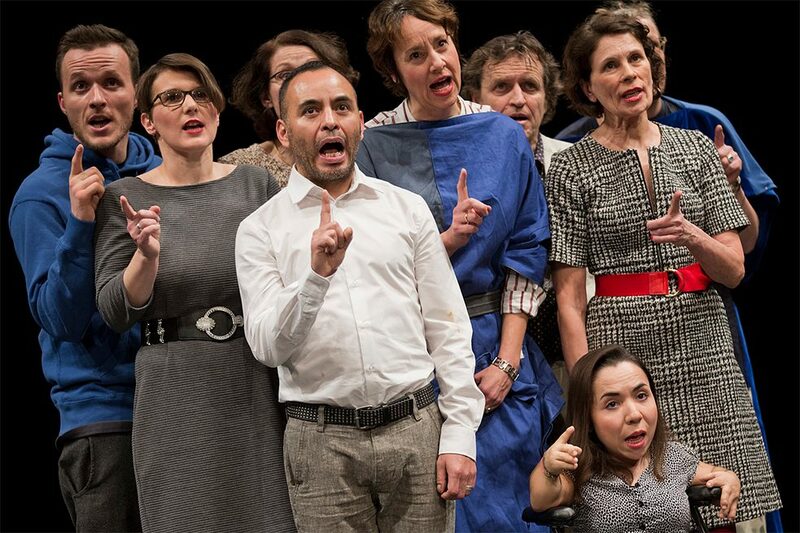 The group also assign an active role to the audience in their latest play, Oratorium, which premiered at the HAU after a number of previews in February 2018. The issues addressed are the power of private ownership and the distribution of goods. Romy König is a writer and journalist who reports on healthcare, business and culture.